I thought I was imagining things or that my eyes were so dry they stung when moisture was finally there, but no, these eye drops have been burning my eyes. At first it was just a light tingle and the back of the box warns that some might experience that, so I didn't worry. The next time I used the drops they burned slightly and left my eyes feeling gritty and strained. Foolishly, I thought this just meant I really needed to use more eye drops if my eyes were so sore/dry. I just used the drops again an hour ago and the burning is a lot more intense and still hasn't gone away even after rinsing my eyes with a saline solution. I really hope I don't have to go to the doctor for this. Obviously, I DO NOT recommend. We're very sorry to hear about this! We would like to learn more about your experience using our eye drops. Please give us a call at 1-888-734-7648 M-F between the hours of 9A-5:30P ET. Thank you and have a great day. The drops provided relief for my burning, itching irritated eyes. Experienced the same and worse than a recent reviewer. I used this last night, when eyes felt especially dry and itchy.... Right after using, i felt a strong burning. Usually this type of reaction goes away quickly, but this did not. This morning I awoke and found that I had a subconjunctival hemmorhage in my right eye. I hope it is nothing worse, so will be going to the eye Dr. to check this out. Sure will not use this product again and do caution others to be aware. We're terribly sorry to hear about this! We would like to speak to you more about your experience using our product. Please give us a call at ​1-888-734-7648 M-F between the hours of 9A-5:30P ET. We're looking forward to speaking with you, have a great day! Burns so bad!! I tend to have dry eyes at the end of the day after removing my contacts so I picked up this product in hopes of relief. At first I had a light stinging but the sting just got worse and worse, made my tear ducts burn even more then it made my vision blurry. I love all the other Visine products but this was a no go for me. We are sorry to hear about your experience with our product! We would like to learn more about this. When you get a free moment, give us a call at 1-800-661-4659, Monday - Friday, 9am - 5:30pm ET. We hope to hear from you soon! Bought this product to relieve eye redness and dryness. After one drop in each eye I experienced burning, itchiness and bluriness. I contacted the 1-800 number, but haven’t up after being on hold for over 20 min. I wish I would have looked at reviews before buying. Total waste of money plus not I’m concerned with any long term effects this product could have caused! Hey there, we'd never expect this to happen while using our products! When you have a chance, we'd like to learn more about your experience and see how we can help. Please give us a call at 1-888-734-7648. We're available Monday through Friday 9 AM - 5:30 PM ET. We look forward to hearing from you. Right after using this product, my vision gets blurry for about 15 to 20 minutes. There is a slight halo effect for a while after too. It goes away though and my eyes feel great the rest of the day. I bike commute to work and it helps my wind affected eyes feel awesome. Thanks for reaching out! We’d love to talk to you to learn more about your experience! Our phone number is 1-888-734-7648, we’re here M-F 9:00AM – 5:30PM ET. Please share your user name so we can link your review and your call. Talk to you soon! 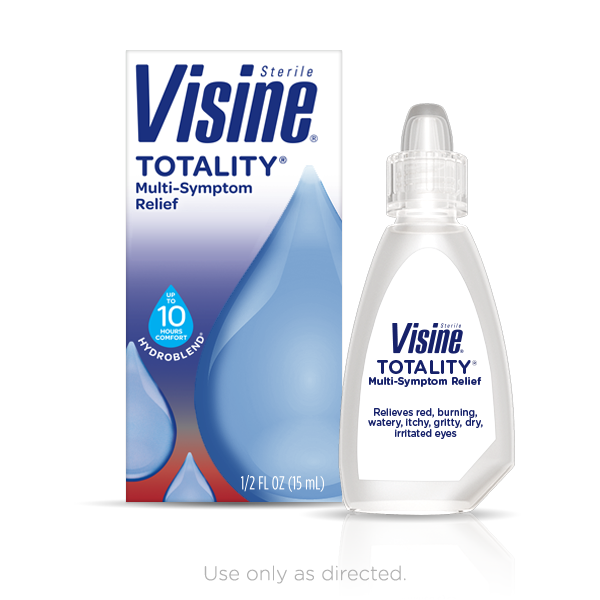 I normally use Visine Original, but decided to give Totality a try. It caused blurry vision for me. I won't be using it again. We're very sorry to hear about this! We would like to learn more about your experience using our product. Please give us a call at 1-888-734-7648 M-F between the hours of 9A-5:30P ET. Thank you and have a great day.